The original Skylab space station (left) launched atop a Saturn V moon rocket. 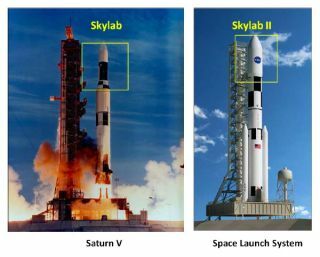 Skylab II (right) would blast off atop NASA's Space Launch System. NASA's first manned outpost in deep space may be a repurposed rocket part, just like the agency's first-ever astronaut abode in Earth orbit. With a little tinkering, the upper-stage hydrogen propellant tank of NASA's huge Space Launch System rocket would make a nice and relatively cheap deep-space habitat, some researchers say. They call the proposed craft "Skylab II," an homage to the 1970s Skylab space station that was a modified third stage of a Saturn V moon rocket. "This idea is not challenging technology," said Brand Griffin, an engineer with Gray Research, Inc., who works with the Advanced Concepts Office at NASA's Marshall Space Flight Center in Huntsville, Ala.
Astronauts would reach the Skylab II deep-space habitat aboard NASA's Orion Multi-Purpose Crew Vehicle. NASA is developing the Space Launch System (SLS) to launch astronauts toward distant destinations such as near-Earth asteroids and Mars. The rocket's first test flight is slated for 2017, and NASA wants it to start lofting crews by 2021. The SLS will stand 384 feet tall (117 meters) in its biggest ("evolved") incarnation, which will be capable of blasting 130 metric tons of payload to orbit. Its upper-stage hydrogen tank is big, too, measuring 36.1 feet tall by 27.6 feet wide (11.15 m by 8.5 m). The tank's dimensions yield an internal volume of 17,481 cubic feet (495 cubic m) — roughly equivalent to a two-story house. That's much roomier than a potential deep-space habitat derived from modules of the International Space Station (ISS), which are just 14.8 feet (4.5 m) wide, Griffin said. The tank-based Skylab II could accommodate a crew of four comfortably and carry enough gear and food to last for several years at a time without requiring a resupply, he added. Further, it would launch aboard the SLS in a single piece, whereas ISS-derived habitats would need to link up multiple components in space. Because of this, Skylab II would require relatively few launches to establish and maintain, Griffin said. That and the use of existing SLS-manufacturing infrastructure would translate into big cost savings — a key selling point in today's tough fiscal climate. "We will have the facilities in place, the tooling, the personnel, all the supply chain and everything else," Griffin said. He compared the overall concept with the original Skylab space station, which was built in a time of declining NASA budgets after the boom years of the Apollo program. Skylab "was a project embedded under the Apollo program," Griffin said. "In many ways, this could follow that same pattern. It could be a project embedded under SLS and be able to, ideally, not incur some of the costs of program startup." The Skylab II deep-space habitat would be made from the Space Launch System's upper-stage hydrogen tank. Griffin and his colleagues envision placing Skylab II at the Earth-moon Lagrange point 2, a gravitationally stable location beyond the moon's far side. Over the past year or so, NASA has been drawing up plans for a possible manned outpost at EM-L2. A station there would establish a human presence in deep space, serve as a staging ground for lunar operations and help build momentum for exploring more distant destinations, such as asteroids and Mars, advocates say. The Skylab II concept could also help ferry astronauts to these far-flung locales, Griffin said. "You can build multiple vehicles," he said. "If we were to send this one, the first one, out to Earth-moon L2, you could build another that that could be a transit hab. So rather than having to go back and use space station parts, you would be able to pick these off the line."